Imagination is the most precious gift God has given to me, and I try to use it as a reminder that the fruit of our imagination is everywhere. Three sisters are making shadow puppets against the wall of their room and their imaginations are making their creations larger than life. 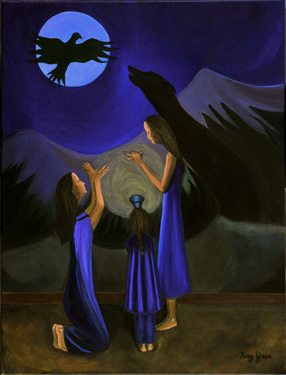 The spirits of the Eagle and the Wolf remind us that we are powerful creators and must use our powers effectively. Sometimes our imagination can create nightmares and illusions. If we use it wisely we can restore balance and create peace on Earth.